VATICAN CITY (CNS) -- Financial and economic decisions -- everything from where a family chooses to invest its savings to where a multinational corporation declares its tax residence -- are ethical decisions that can be virtuous or sinful, a new Vatican document said. "There can be no area of human action that legitimately claims to be either outside of or impermeable to ethical principles based on liberty, truth, justice and solidarity," said the document from the Congregation for the Doctrine of the Faith and the Dicastery for Promoting Integral Human Development. 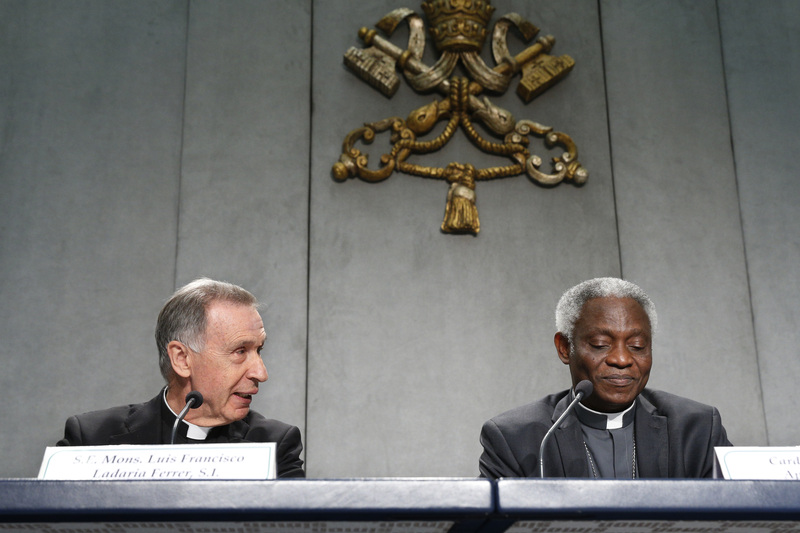 The text, "Considerations for an Ethical Discernment Regarding Some Aspects of the Present Economic-Financial System," was approved by Pope Francis and released May 17 at a Vatican news conference with Archbishop Luis F. Ladaria, congregation prefect, and Cardinal Peter Turkson, head of the dicastery. Based on principles long part of Catholic social teaching and referring frequently to the teaching of St. John Paul II, Pope Benedict XVI and Pope Francis, the document insisted that every economic activity has a moral and ethical dimension. Everything from where a family chooses to invest its savings to where a multinational corporation declares its tax residence -- are ethical decisions. Responding to questions, Archbishop Ladaria said it is true that Catholic moral theology has focused more on questions of sexual ethics than business ethics, but that does not mean that the economy and finance are outside the scope of Catholic moral teaching. For example, he said, over the centuries the church and the popes repeatedly have intervened to condemn usury. Pope Francis, he said, supported the development of the document, but the idea of writing it and examining the ethical and moral implications of the current economic scene came from "the grassroots." "At stake is the authentic well-being of a majority of the men and women of our planet who are at risk of being 'excluded and marginalized' from development and true well-being while a minority, indifferent to the condition of the majority, exploits and reserves for itself substantial resources and wealth," the document said. The size and complexity of the global economy, it said, may lead most people to think there is nothing they can do to promote an economy of solidarity and contribute to the well-being of everyone in the world, but every financial choice a person makes -- especially if they act with others -- can make a difference, it said. "For instance, the markets live thanks to the supply and demand of goods," it said. "It becomes therefore quite evident how important a critical and responsible exercise of consumption and savings actually is." Even something as simple as shopping can be important, the document said. Consumers should avoid products manufactured in conditions "in which the violation of the most elementary human rights is normal." They can avoid doing business with companies "whose ethics in fact do not know any interest other than that of the profit of their shareholders at any cost." Even something as simple as shopping can be important, the document said. Being ethical, it said, also can mean preferring to put one's savings in investments that have been certified as socially responsible and they can join others in shareholder actions meant to promote more ethical behavior by the companies in which they invest. In a statement distributed at the news conference, Archbishop Ladaria said that "the origin of the spread of dishonest and predatory financial practices" is a misunderstanding of who the human person is. "No longer knowing who he is and why he is in the world, he no longer knows how to act for the good" and ends up doing what seems convenient at the moment. "The strongest economic subjects have become 'superstars' who hoard enormous quantities of resources, resources that are distributed less than before and are increasingly concentrated in the hands of a few people," he said. "It's incredible to think that 10 people can possess almost half of the world's wealth, but today that is a reality!" Cardinal Turkson told reporters, "a healthy economic system is vital to forge flourishing human relationships." "To help generate such healthy system, this joint document reminds us that the resources of the world are destined to serve the dignity of the human person and must be commonly available for the common good," the cardinal said. The document takes aim at greed, not capitalism. In fact, it praises economic systems and markets that respect human dignity and promote human freedom, creativity, production, responsibility, work and solidarity. Whose interests should be the first priority for U.S. trade policy? A healthy economy, it said, promotes all of those goods and realizes that the measure of progress is not how much money people have in the bank, but how many people are helped to live better lives. One key to judging how well the economy works is how many decent jobs are created, the document said. But too often selfishness gets the upper hand, the rich speculate and gamble, accumulating more money but not creating more jobs. "No profit is in fact legitimate when it falls short of the objective of the integral promotion of the human person, the universal destination of goods and the preferential option for the poor," the document said. "It is especially necessary to provide an ethical reflection on certain aspects of financial transactions which, when operating without the necessary anthropological and moral foundations, have not only produced manifest abuses and injustice, but also demonstrated a capacity to create systemic and worldwide economic crisis," the document said. The global financial crisis that began in 2007, it said, created an opportunity to review mechanisms of the economy and finance and come up with corrective regulations, but very little has been done. In addition to the immorality of usury and tax evasion, the document signaled out other ethically problematic practices or practices that require more regulation to ensure ethical behavior: for example, executive bonus incentives based only on short-term profit; the operation of "offshore" financial bases that can facilitate tax evasion and the outflow of capital from developing countries; "the creation of stocks of credit," like subprime mortgages, and credit default swaps; and the growth of the "shadow banking system." Economic activity has a moral dimension. So it does. But the Church has never been especially right on these activities so it should be very careful on it. Usury is a good example. The article comes close to getting the most important thing right. Freedom is paramount. But it is freedom of both the buyer and seller. When one is impaired there should be forces to ensure both. But it should be minimal. The article confuses wealth with control of resources. They are not the same thing. We live in a very different time from the past when nearly all wealth had to do with agriculture. So far different today. Maybe the Church should point out how Catholic Social Teaching creates jobs. i have never seen here or anywhere else examples of how it does. Free market capitalism has been the greatest creator of jobs in the history of mankind. It is the most moral of all economic systems but somehow I doubt the Vatican equates it with Catholics Social Teaching. The Church is missing a big opportunity here, applying Catholic moral teaching not Social Teaching as a layer above the free market to guide individuals. It is individual salvation that is paramount. When individuals make their decisions based on moral guides, the poor will be the beneficiaries. But the Church should steer clear of trying to create a heaven on earth through policies because invariably they create a hell for the poor instead. The irony is that Catholic Social Teaching will prevent the lifting of the poor out of poverty while Catholic moral teaching and free market capitalism will eventually eliminate extreme poverty. When will we see Elizabeth Breunig here writing about socialism, the most immoral of all economic systems? Vatican rails against speculation yet runs a lottery in which the odds of winning are infinitesimal. OMG! I say that in gratitude. Finally, a document that provides a moral dimension to the accretion, accumulation and distribution of wealth from Catholic thinkers, moralists, from the Pope himself. If I interpret this reporting correctly, the best part of it is the principle that, whatever economic system exists, it must provide what is essentially a decent economic life to every person in that society. That provision is based on the intrinsic nature of being a child of God and irrelevant of whether the person is good or bad as judged by that society. This is another papal document the words of which will never be heard from a pulpit sermon! They are words that will offend the comfortable in their laxity of concern about the poor. So at what magical point does the Church's exhortation to "Solidarity" impinge on the Church's requirement of "Subsidiarity" ? At one extreme of Solidarity we have Marxist Leninist economics and at the other end of Subsidiarity we find Adam Smith's invisible hand. And at what point does the intersection of these two demands best serve "....liberty , truth and justice...."? Progressives seem to think these issues are reconciled at the government level (Solidarity) and Conservatives seem to think it is found at the individual level ( Subsidiarity).